One of the oldest buildings in the city, which miraculously survived the bombing during WW2. It is rapidly becoming a must for devotees of live rock music in the upstairs bar. Most of the downstairs area is original, except the end where the bar itself is, which dates from the 1960s. Beers are always from the Theakston's guest range. 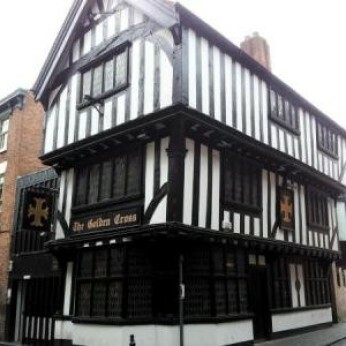 The Golden Cross is Grade 2 listed building which has just undergone a major refurbishment with a new light and more cosy atmosphere and is boasting a new home cooked menu including many gluten free options along with a range of cask ales. A large range of spirits are available including 30+ Gins.